How can you get to the beach without leaving Tucson? Easy! Just catch a wave over to the northwest corner of Sunrise and Swan and look for the flip-flops on the door and the portholes on the wall. And we did just that on this week’s live broadcast from Fini’s Landing! 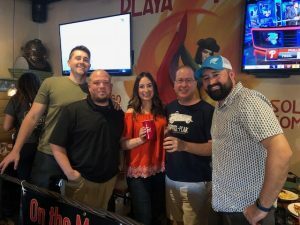 Our celebrity co-host was Chris Cohen of Young’s Market Company who talked about beach drinks as well as some splishy-splashy events coming up from our good friends with the Centurions. We then turned to Ashley James of CODAC who revealed the latest news on the upcoming Dine Our For Safety event. Fini’s Landing bar manager Tyler Moody then paddled over to the table to transport our taste buds to the tropics with his line-up of tropical cocktails! And then the King showed up. Kenny King Kahuna, general manager/chef at Fini’s Landing! 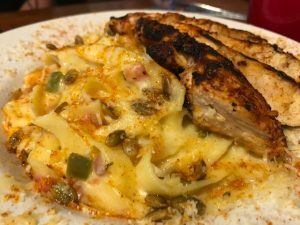 New dish coming soon to Fini’s: Chubasco Chicken Pasta, with fresh egg fettuccini, monterey jack and parmesan alfredo sauce, fresh lime, chile lime pepitas, and blackened Chubasco chicken! He got us current (get it?) with his weekend beachfront breakfast menu, while teasing us a bit on some of the new dishes that are about to land on his menu. Chubasco Chicken Pasta, anyone? See you at the beach!